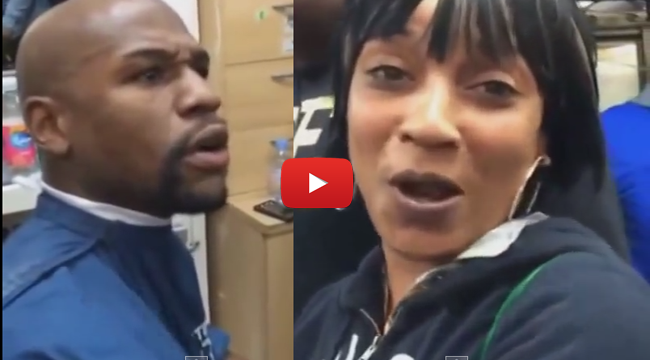 American boxer Floyd Mayweather Jr was caught on cam arguing with a Jamaican woman while he was having his haircut in Brixton, London. The boxing icon with a record of having to lost fight also seemed to refuse to lose with verbally fighting against a woman when she insisted that she does not know him. The clip had started when the argument is already heated and the woman repeated many times that she does not know him right at his face. Mayweather is the highest paid athlete and he could not accept that the woman did not even bat her eyelashes when he said who he is and typical of him, he even urged her to immediately search him in Google. The woman said that she did not get why it is such a big deal. She knows Mike Tyson but not Mayweather. The boxer stood to taunt the woman and said that it is him who needed to Google her. She also said that she likes big and exciting fights, if it is not big then she won’t watch it. This statement visibly hit the pride of Mayweather as his face suddenly changed the mood and his brow moved together. Seemingly desperate to prove that he is a real big deal, he boasted that he was even featured in Forbes magazine as the top paid athlete. The video had been posted last Wednesday, October 1, by YouTube account user Can’t Ban the Snowman and it now has more than 600 thousand views as of its second day online. Mayweather had been frequenting the news lately when he added more demands to make his fight with Filipino boxer icon Manny Pacquiao a reality. When Pacquiao answered back questioning his untarnished record of no lose he jeered against PacMan, posting a photo on his Instagram with Pacman lying in a boxing ring. Pacquiao just let it go and said he feels sorry for Mayweather.